Before you get into the entire merry-making vibe, it pays to first give your home a once-over. Preparing your home for the winter by tending to necessary repairs and replacements can help your nest remain cozy during the colder months. In this post, the leading source of energy-efficient windows and entry doors in St. Louis, MO, Renewal by Andersen of St. Louis, shares what parts of your home should be inspected before the year’s first frost. Inspect your window frames for signs of wear, rot, or rust. Repairing or replacing worn window frames can help maintain your unit’s structural integrity. It also helps to inspect your home for areas that are colder than the others, especially those around windows. An uneven or unstable indoor temperature doesn’t always mean that something’s wrong with your heating and cooling system. Sometimes it indicates that your windows are not working as well as they used to. In some instances, some caulk can solve drafty windows. However, if the draft is caused by cracks, broken glass, or gaps, ordering a replacement window from Renewal by Andersen of St. Louis can be your smartest move. Our windows are energy-efficient to help keep your nest cozy all year long. We carry many beautiful window styles to help spruce up your home, just in time for the holidays. Make sure your doors are draft-free by examining the weatherstripping around doorframes for signs of wear. Replacing worn weatherstripping with more efficient ones can slow heat loss. You can also create your own door draft stopper, also called a draft snake. Your draft snake can be as simple as a roll of blanket or towel placed along the bottom crack of your doors, or you can get crafty by adding buttons, sequins, and other embellishments. A draft snake, however, may not work as well with older doors. If this is the case, now might be the time to replace your old, drafty unit with one of our attractive St. Louis French doors. 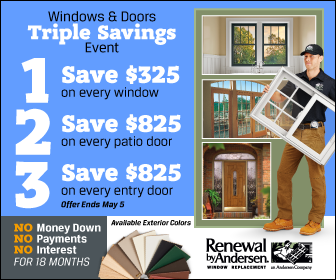 Renewal by Andersen offers an entire range of attractive, energy-efficient windows and doors especially designed to keep the chills away. Ask us how we can help you prepare your home for the winter. Call us today at (314) 332-2364 for a free estimate!